The adapter regularly executes its OnTask() method, which executes the given query. The polling interval is determined by the CallInterval setting. If this row has already been processed and has not changed, the adapter ignores it. To determine if a given row has already been processed, the adapter uses the information in the KeyFieldName setting; see Processing Only New Rows later in this chapter. If this row has already been processed (as identified by the KeyFieldName setting) and an error occurred, the adapter ignores it until the next restart. Otherwise, the adapter builds an instance of the EnsLib.SQL.Snapshot class and puts the row data into it. This instance is the snapshot object. Using the Default Snapshot Object later in this chapter provides details on this object. The adapter then calls the internal ProcessInput() method of the associated business service class, passing the snapshot object as input. The internal ProcessInput() method of the business service class executes. This method performs basic Ensemble tasks such as setting up a monitor and error logging; these tasks are needed by all business services. You do not customize or override this method, which your business service class inherits. In your class, the ADAPTER parameter should equal EnsLib.SQL.InboundAdapter. Studio provides a wizard that you can use to create a stub similar to the preceding. To access this wizard, click New on the File menu and then click the Production tab. Choose to create a business service and select EnsLib.SQL.InboundAdapter as the associated inbound adapter. The wizard then uses EnsLib.SQL.Snapshot as the specific input argument needed with this adapter. Here pInput is the snapshot object that the adapter sends to this business service; this is an instance of EnsLib.SQL.Snapshot. Also, pOutput is the generic output argument required in the method signature. Optionally check the status of the previous action and act upon it. Optionally examine the response message that your business service has received and act upon it. When you create a business service class to work with EnsLib.SQL.InboundAdapter, the adapter passes a snapshot object (an instance of EnsLib.SQL.Snapshot) to your custom OnProcessInput() method. This instance contains data for one row of the data returned by your query. Your OnProcessInput() method typically uses the data available in this object. The EnsLib.SQL.Snapshot class provides properties and methods to manage multiple rows. However, multiple-row snapshots are relevant only for operations that use the outbound adapter, described later in this book. Returns the value of the column that has the name pName, in the current row (which is the only row in this case). Returns the value of the column whose position is specified by pColumn in the current row (which is the only row in this case). From left to right, the first column is 1, the second column is 2, and so on. Returns the SQL type of the column whose position is specified by pColumn, for example, VARCHAR, DATE, or INTEGER. To initialize the inbound adapter, customize the OnInit() method of your custom business service class. This method is executed during startup of the business host; by default, this method does nothing. The most common reason to initialize the adapter is to initialize values for use as parameters of the query, as described in Specifying Inbound Queries. The following subsections list the relevant methods and provide an example. Use this to initialize a name-value pair associated with the adapter and then use the name for a parameter of the query. This method checks the current value of the given persistent name-value pair. If the value is currently null, this method sets it equal to pNewValue. By default, if you omit the name, the method initializes the persistent name-value pair &%LastKey which contains the IDKey value of the last row processed by the adapter. In some cases, you might instead need the InitializeLastKeyValue(), which initializes the transient adapter property %LastKey. This property is reset each time the business service is started. Also see the class documentation for EnsLib.SQL.InboundAdapter for information on the related methods SetPersistentValue() and GetPersistentValue(). 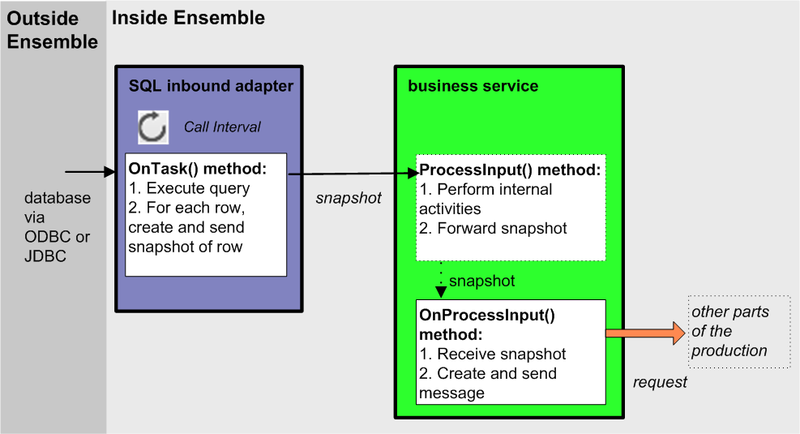 Add an instance of your custom business service class to the Ensemble production. Set the PoolSize setting to 1. If PoolSize is larger than 1, the adapter will process many records twice. These topics are discussed later in this chapter. This data source name specifies the external data source to which to connect. Ensemble distinguishes between these three forms automatically: a defined Caché SQL Gateway connection, a JDBC URL, or an ODBC DSN configured in your operating system. If this name matches the name of a JDBC or ODBC connection configured from the System Administration > Configure > Connectivity > SQL Gateway Connections page of the Management Portal, Ensemble uses the parameters from that specification. If the entry is not the name of a configured connection and it contains a colon (:), it assumes a JDBC URL, otherwise it assumes an ODBC DSN. If this data source is protected by a password, create Ensemble credentials to contain the username and password. Then set the Credentials setting equal to the ID of those credentials; see Specifying Other Runtime Settings for details. SELECT p1,p2,p3 FROM Customer WHERE updatetimestamp > ? SELECT * FROM Sample.Person WHERE ID > ? SELECT * FROM Sample.Person WHERE Age > ?, PostalCode = ? You can use a property of the adapter. Within the Parameters setting, to refer to a property of the adapter, simply refer to the property by its name. Within the Parameters setting, if a parameter name starts with a dollar sign ($), Ensemble assumes that it is a property of the service class. You can refer to a special persistent value such as &%LastKey, which contains the IDKey value of the last row processed by the adapter. Within the Parameters setting, if a parameter name starts with an ampersand (&), Ensemble assumes that it is a special persistent value. Because it is often undesirable to keep executing a query against the same data, the EnsLib.SQL.InboundAdapter provides several tools that you can use to keep track of the rows that it has processed. This section discusses those tools and then describes several ways to use them in practice. Be sure to set the PoolSize setting equal to 1. If it is larger than 1, the adapter will process many records twice. If you specify the KeyFieldName setting, the adapter adds data to a Caché global that indicates which rows it has processed. This setting should refer to a field that contains values that are not reused over time; this field must be in the result set returned by the query. The adapter uses the data in that field to evaluate whether a row has previously been processed. The adapter provides a persistent value, &%LastKey, that contains the value of the Key Field Name for the last row that was processed. This special persistent value is saved when you restart the business service. The adapter provides a transient property, %LastKey, that contains the value of the KeyFieldName for the last row that was processed. This adapter property is created each time you restart the associated business service. Use the KeyFieldName setting of the adapter. If specified, this setting should refer to a field that contains values that are not reused over time; this field must be in the result set returned by the query. If you specify a KeyFieldName, the adapter uses the data in that field to evaluate whether a row has previously been processed. Note that if you specify the pseudo field %ID in the SELECT and want to specify this field as the KeyFieldName, you should specify the KeyFieldName as ID and should omit the % (percent sign). This technique can be inefficient because Ensemble might select a large number of rows during each polling cycle, and only a small number of those rows might be new. SELECT ID,Name,Done from Sample.Person WHERE ID>? After executing the query, delete the source data or update it so that the query will not return the same rows. To do this, you use the DeleteQuery setting. By default, after the EnsLib.SQL.InboundAdapter executes the main query (the Query setting), it executes the DeleteQuery once for each row returned by the main query. This query must include exactly one replaceable parameter (a question mark), which the adapter will replace with value specified by KeyFieldName. This query can either delete the source data or can perform an update to ensure that the same rows will not be selected by the main query of the adapter. UPDATE Sample.Person SET Done=1 WHERE ID=? Include a column in the relevant table to record if a given row has been changed. Install an update trigger in the data source to update that column when appropriate. Within the query used by the adapter, use the value of this column to determine whether to select a given row. This section provides examples that use the preceding settings. Here '216' refers to the CustomerID of the row being processed. After the production startup, during each polling cycle, the adapter will select all rows but will process only the rows that have a new value in the CustomerID field. This example is a variation of the preceding. In this case, the main query selects a subset of the rows, which is more efficient than selecting all the rows. Query SELECT * FROM Customer WHERE ID>? In each polling cycle, the adapter determines the value of &%LastKey and passes that value to SQL. In this case, the value of &%LastKey will always be set to the highest CustomerID and no rows will be selected more than once. In this example, the Customer table has a field called Done, in which we can record whether the adapter has previously selected a given row. DeleteQuery UPDATE Customer SET Done=1 WHERE CustomerID=? In common with the preceding example, this example selects any given row only once. Using the delete query can be slow, because this query is executed once for each row that is processed. It is more efficient to perform a batch delete (or batch update) at a regular interval. In many cases, you might want to treat multiple table fields collectively as the primary key. For example, you might have a table of statistics that includes the fields Month and Year, and your query might need to treat the month and year together as the unique key for the adapter. In such a case, you would use a query that concatenates the relevant fields and uses the AS clause to provide an alias for the composite field. The result set available in the adapter will have a field named ID, which you can use for KeyFieldName. The syntax for concatenation depends upon the database with which you are working. In some cases, you might not want to use KeyFieldName. If KeyFieldName is null, the adapter does not distinguish rows and does not skip rows that had either an error or were successfully processed already. Query Select * from Cinema.Film Where TicketsSold>? EnsLib.SQL.InboundAdapter provides the following additional runtime settings. Specifies the polling interval, in seconds, for the adapter. This specifies how frequently this adapter checks for input. Upon polling, if the adapter finds input, it creates an appropriate Ensemble object and passes the object to its associated business service. If several inputs are detected at once, the adapter processes all of them sequentially until no more are found. The adapter sends one request to the business service for each item of input it finds. The adapter then waits for the polling interval to elapse before checking for input again. This cycle continues whenever the production is running and the business service is enabled and scheduled to be active. It is possible to set a property in the business service so that the adapter delays for the duration of the CallInterval in between processing each input. For details, see Developing Ensemble Productions. ID of the Ensemble credentials that can authorize a connection to the given DSN. For information on creating Ensemble credentials, see Configuring Ensemble Productions. If this setting is 0, the adapter will disconnect immediately after each SQL command. If this setting is 1, the adapter auto-connects on startup and then stays connected. Use this value, for example, if you are managing database transactions as described in Managing Transactions, later in this book. During development and testing, you might find it useful to reset the adapter for a given business service in order to repeat previous tests. To do so, use one of the following methods described here; these are class methods inherited by EnsLib.SQL.InboundAdapter. You do not normally use these methods within a live production. Clears all runtime data for the business service that has the given configured name. Note that you can use the adapter property %ConfigName to access the name of currently configured business service. This data is cleared automatically each time the business service starts. Clears static data for the business service specified by the configured name. This data includes all persistent values associated with the adapter, such as the persistent last key value. This method just executes the ClearRuntimeAppData() and ClearStaticAppData() class methods.